The non-clinical spotlight series exists to shed light on all of the interesting paths that physical therapy professionals have taken. 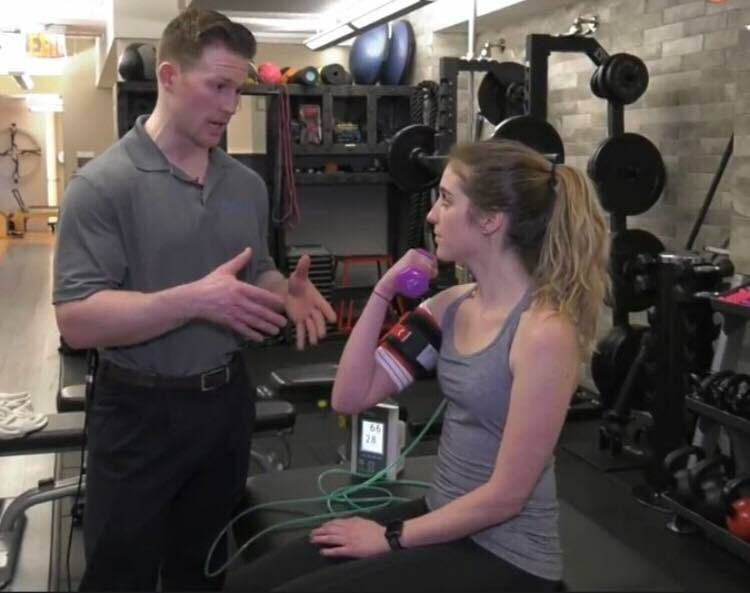 Today’s spotlight focuses on Nicholas Rolnick, PT, DPT, who went from physical therapist to educator, entrepreneur, and PT influencer on the topic of blood flow restriction. Where was your first job, and what did you do? My first job out of school was with a small private outpatient orthopedic group in NYC as a staff physical therapist. I worked with all different types of orthopedic conditions. Why did you leave that first job? In my first job as a clinician, the realities of the healthcare system conflicted with my idealism. I witnessed firsthand that the priority was about making money and not as patient-centered. What did you do next? Did you enjoy it? Before deciding to go full-in on my business, I tried home health for a week and it really didn’t fit well with my passions. I admire all that home health clinicians do with their patients, I just recognized that my path would be different. At what point did you decide to launch a cash-based company? What was your goal for doing that? After the home health experience, I became quickly determined to start my own business. I knew that my long-term goals and vision were not going to be compatible with a traditional career in physical therapy so I decided to take a leap of faith into cash-based practice. In theory, this would allow me to be completely patient-centered. In the three years working in an outpatient clinic as a physical therapy aide, a student physical therapist and a physical therapist, I saw the problems in the current treatment model and believed there had to be a better way. My company, “The Human Performance Mechanic,” is 100% patient-centered. My mission is to provide optimum therapy solutions for patients to experience the joy of pain-free movement. In our current “sick care system,” patients take a back seat to the dictates of insurance companies. This system hurts the patient and prevents the provider from providing optimum therapies for their patients. My goal with “The Human Performance Mechanic” is to lead the charge in transitioning from our current “Sick Care System” which is economically unsustainable to a sustainable “Wellness System” using my expertise in rehabilitation, fitness, behavioral psychology and human performance. I actually wrote a blog about a similar topic here. Cash-based physical therapy provides the patient-centered environment necessary to achieve the best outcomes for the patient. I spend a full hour with every patient I see. This allows me to deliver premium services that extend far beyond the traditional outpatient encounter. The patient wins because they get better faster and the provider wins because he/she is no longer shackled to the constraints of an insurance-based model that’s designed to favor the insurance companies! Ultimately, my objective is to be a world class physical therapist so I could provide the best therapies for my patients. To achieve this, I will need to hone my craft as a physical therapist, spend time researching the most up-to-date techniques and technologies and spreading those ideas to other practitioners. My ideal schedule would be 20-25 hours/week as a clinician and the rest of the time involved in research and teaching. How does your work in blood flow occlusion fit into this career path? Blood flow occlusion is a fringe technology that is about to go mainstream. My expertise in blood flow occlusion training is providing me the platform to grow my personal business in NYC and establish research connections interested in exploring this therapy! I believe that this is a part of the future of rehabilitation that will help improve patient outcomes. Working as a contributing author for the Brookbush Institute of Human Movement Science. They take care of my rent and expenses! At what point did you realize that you had a passion for education? When you realized that you enjoyed education, what steps did you take? I realized early on in my DPT education that I had a tremendous appetite to want to know as much as I can about subjects that were important to me. I was one of the go-to students in my class in first year cadaver lab, and I wound up answering questions about structures and their relation to what we were learning. I absolutely loved anatomy and its application to function. It all just clicked for me, and I loved sharing my passion with my other classmates. In the second year of DPT school, I took advantage of social media. I reached out to a couple of local clinicians I had been following on Facebook and wanted to shadow their practice. This is where I got in contact with Brent Brookbush, President and Founder of the Brookbush Institute. I had been following him on Facebook and YouTube for a couple of months and wanted to meet him. I sent him a Facebook message asking to shadow him, and the relationship evolved over a couple of months to him offering me a job as a contributing author for his website. In my last academic semester of PT school, I was selected to be an orthopedics lab TA. My role was to supervise, instruct, and administer practicals for the 2nd year students who were studying the upper extremity. I had a really good time and couldn’t believe people got paid for that! At the same time, I was selected as the sole instructor for the cadaver anatomy laboratory course for the 2nd year Physiatry residents at Columbia University Medical Center. I designed a course curriculum, session outline and even created handouts. It was my first real foray into teaching a course from start to finish and I loved it. How did you hear about the Concordia University role? Did you need any special education to land that role? Did you apply online or in person? Working with the Brookbush Institute opened this door for me. Concordia University and the Brookbush Institute partnered together and were using the Brookbush Institute’s educational content as a supplement to their introductory kinesiology and applied functional anatomy courses. Brent got an e-mail back in early October 2016 asking if any of his staff wanted to teach for Concordia in their introductory courses. I, of course, jumped on that offer and began training almost immediately. I have been working for them since November, 2016 and absolutely love it! I have been teaching two courses each term (total of about 30 students per term) in this online curriculum. I have made it my own! I am trying to change the landscape of online education by fostering a sense of community and interaction between students and professor that has not been done before. At what point did you land your role as a contributing author for the Brookbush Institute for Human Movement Science? After about 4-5 months of shadowing him, Brent offered me a job because he knew that I had a passion for reading research and educating others. To learn more about him and his mission and vision, click here. How did you find the role with Brookbush? Is it per diem/part-time/full-time? This is one of the best roles that I have ever had. It is totally per diem and I have grown within the company to now take on larger, research-based opportunities. My original job as a contributing author was to synthesize clinical research and translate it to recommendations for human movement professionals (DOs, DPTs, ATCs, Personal Trainers etc.). Within the research review, I also commented on if it fit within the postural dysfunction models recommended by the Brookbush Institute. I also comment on strengths/weakness in the study design and where it fits within the current body of knowledge. I really learn a lot from writing these reviews! So far, I have published 37 since I started. Back in August 2017, I received a new assignment to write about the neuromusculoskeletal adaptations from high-velocity (power) training. This was my first major assignment and that article was a doozy! 175 citations later, I finished it earlier this year…But again, I got paid to research, learn and write. What could be better? You’re pretty busy, but I know you’re working a lot in the blood flow restriction therapy realm. What are you doing in that respect? Since early March, 2018, I have been running a private Facebook group (with over 400 clinicians/student clinicians) with two other clinicians disseminating research on blood flow restriction therapy. We have just partnered with the Brookbush Institute to develop online blood flow restriction courses for the Brookbush Institute membership base. This is an exciting opportunity to continue to foster my love for education with my passion for blood flow restriction therapy. I am super excited and can’t wait to see what the future has in store! What are the biggest pros/cons to having your hands in so many career pots, so to speak? I’m just really lucky to have found my calling. I love what I do and my time is divided up differently almost every day. I would say though, that if you’re not loving what you’re doing, then it would be difficult to be 100% dedicated. Then the probability of burning out is high. I’ve learned that the one guarantee of life is change. Things are constantly evolving. There is no typical day! Right now, I am on the ground floor of business development. I’m making it my mission to help change the “sick care system” to a “wellness system” and am using my business as a vehicle to do it. I would say currently I see patients less than 20% of my time, but it’s quickly building as people receive my message. For the other 80% of the time, I am working on doing either grassroots marketing, writing blogs, working for the Brookbush Institute or Concordia University. What do you think are the biggest challenges and opportunities for today’s PTs? What about for the PT profession as a whole? How do you intend to address these challenges/opportunities? The economics of physical therapy are unsustainable. The cost of education versus the current remuneration is out of balance, especially if you have significant debt. Most physical therapists are held hostage by the status quo of this “sick care system.” We’re not able to really practice our craft the way we’d like and patients end up suffering. We are underpaid for the work we do, and the “healthcare system” we operate in doesn’t do anything to promote our growth. Instead, new graduates are forced to take jobs in physical therapy mill clinics treating 3-4 patients an hour because that’s what the economics dictates. No wonder it leads to burnout! People associate physical therapy with e-stim, ultrasound, ice, heat, massage and all passive modalities. None of which can actually help improve self efficacy, create patient empowerment and long-lasting positive health behaviors. We need to continually work on transitioning our system from the “sick care” insurance-based model to the “wellness” patient-centered model. The current healthcare system is failing EVERYONE and fortunately, it is beginning to change. The result will be that physical therapists will be able to hone their craft and be remunerated based on the value they provide. Patients will benefit! What’s next for you? Do you have 5 year plans? 10 year? Where do you want to go in your career? At one point, my 5-year plan involved earning a PhD and being a catalyst of change in this “healthcare” system. As of right now though, its looking like I want to start a PhD program in 5 years to allow for more personal and professional growth before delving back into being a student again. If I am going to accomplish my mission of changing the “healthcare” system, I need to stay connected to patient-care in some capacity! I want to be able to conduct translational research that clinicians can read and implement in their practice the same day. This is where my interests in blood flow restriction training come into play because I do believe that it will play a significant part in the future of rehabilitation and human performance. In 10-years, it would be pretty cool if I was a full-time faculty member in a DPT program (hopefully my alma-mater, Columbia!) teaching anatomy/orthopedics and clinical use of blood flow restriction training. In my time away from teaching, I imagine I would still have a small caseload of patients and funded research opportunities that continue to shed light on the benefits of blood flow restriction training in rehabilitation and performance populations. What advice would you give to a clinician who wants to pursue education? What about one who wants to pursue working with a con-ed company? I’ve learned there is more that I don’t know then I do know. One thing I can share with great certainty is to make sure in your heart that this is something that you love. If you don’t love it, you’ll never be content. I reached out to many people early on in school to begin establishing a network. Be persistent! Be humble! Be passionate about something! I knew in my second year of DPT school I was never going to have a full-time career as a clinician. I put myself in situations that enabled me to get to where I am today. These connections today have helped me get to where I will be tomorrow. I’m excited for the journey ahead. Thanks for your insight, Nicholas!